Posts that relate to the gaming and live streaming group known as The Sanctuary Crew. 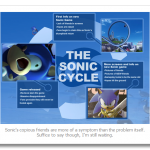 In the past, I have detailed my immense disappointment with Sonic the Hedgehog. I memorized Sonic 3 and Knuckles down to a science as a kid and the game still holds up when I play it today, yet over the past two decades, everything fun and clever about the series has been slowly stripped out to the point where it seems that no one at Sega remembers how to make a worthwhile Sonic game anymore and/or can’t be bothered to research how to do it. Not even Sonic Colors and Sonic Generations were the amazing games I had waited all my life for, and though Sonic Lost World looks like it’ll finally give me the clever, inventive platformer I’ve been expecting, it may be prudent to note that it’s being co-developed by Nintendo, which simultaneously means that it’s all but guaranteed to be awesome and that it technically won’t count as Sonic and Sega’s long overdue return to form. Maybe it could have been, but, among other things, the news and concerns surrounding the recent purchase of Atlus seem to reinforce that the Sega of today is still more of a low quality imitation of the Sega from the 16-bit era. What’s a fan to do? Well, just when all the rom hacks at Sonic Retro were starting to feel boring, a new game bearing the blue hedgehog’s spirit appeared. 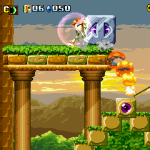 That game is Freedom Planet.